Falcao remains with Monaco but Mbappe – who joined PSG for £166m, initially on loan – and other key players such as defender Benjamin Mendy left the club last summer. 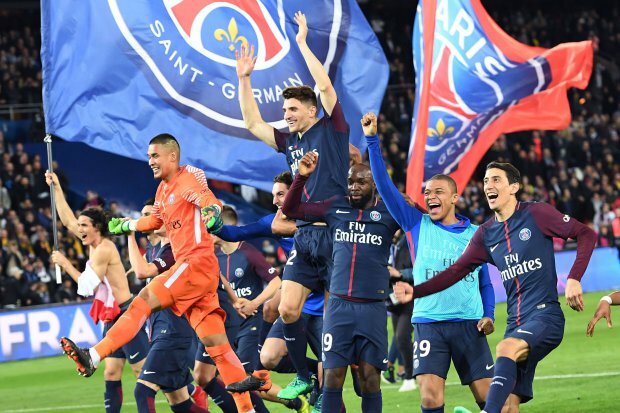 That exodus severely weakened PSG’s strongest challengers so it was almost inevitable that the club from the capital would emerge as French champions again. Uruguayan Cavani added a second with a powerful header from Germany winger Draxler’s cross before Di Maria scored the pick of the goals. Lo Celso nodded in Javier Pastore’s cross to give PSG a 4-0 lead after 27 minutes but Lopes reduced the deficit when he finished at the back post. However, Di Maria steered the ball home after smart play by Pastore and Monaco’s misery was complete when Falcao put through his own net from a corner before Draxler added a seventh on the counter attack. PSG appointed former Sevilla boss Unai Emery as the club’s new manager on a two-year deal in June 2016 and a season later than expected he delivered the title. However, PSG’s disappointing exit from the Champions League at the hands of Real Madrid have left question marks over his future. However, despite his form on the pitch Neymar’s first season in Paris has been beset rumours he is unhappy in the French capital.